Try These Oral Tips for Healthy Aging Month! What Does Healthy Aging Look like in Terms of Oral Health? 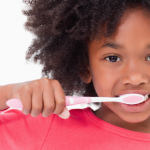 Good oral health care is essential for healthy living. As they age, some adults may be surprised to experience certain dental problems that seem to spontaneously occur. Though these conditions can vary a great deal from person to person, seniors are at higher risk for certain oral health problems. This September, we’re celebrating Healthy Aging Month by discussing the oral conditions that commonly show up in old age, and ways to prevent them. Read on to learn about three oral problems and our best anti-aging tips to avoid them! Get a humidifier to keep moisture in the air at home. Avoid beverages that intensify dry mouth, such as coffee, alcohol, soft drinks and fruit juices. Drink more water! Carry a water bottle with you at all times and keep drinking throughout the day. Visit the dentist each year for your dental cleaning. Floss daily for healthy gums. It’s not necessary to press down hard when you floss. The important thing is to remove the sticky, white/yellow substance that forms on the teeth. 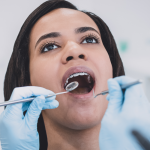 If you suddenly experience gum bleeding despite daily habits of brushing and flossing, you may be experiencing a gum disease flare-up. Schedule an appointment with the dentist to have your gums checked. 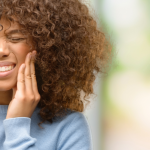 Especially among seniors with other inflammatory conditions, sudden bleeding gums can be a sign of inflammation in another part of the body. It’s important to address this bleeding sooner rather than later, as it can also put you at greater risk for cancer. 90% of oral cancers are associated with tobacco use and excessive alcohol consumption. If you or a loved one smoke at all or drink in excess, quitting these habits is the most important preventative step you can take. Increase fruit and vegetable consumption. Sixteen studies show that each portion of fruit/vegetables consumed daily significantly reduces the risk of oral cancer. Engage in regular aerobic exercise, which has been shown to inhibit cancer growth. Request an oral cancer screening when you visit the dentist. This should be a part of every standard checkup. Celebrate Healthy Aging Month with Beautiful Teeth! 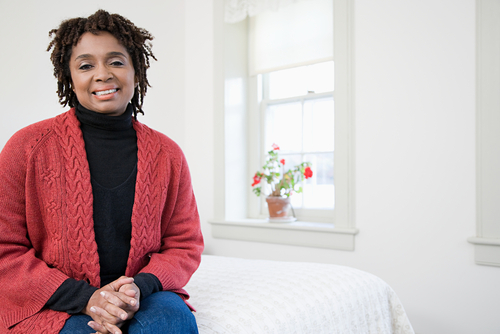 Don’t forget, healthy aging for seniors includes oral health! Poor oral health not only affects how your teeth function, but can leave you more susceptible to heart disease and diabetes. This September, we challenge all our patients to reflect on how well their oral habits are preparing them for healthy aging in the future. No one wants to spend their golden years in and out of the dentist’s office for various oral procedures. With regular dental appointments and daily oral hygiene, you can lower your risk for these conditions. 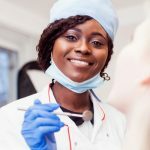 To schedule your next appointment at Penn Dental Medicine, you can reach us at 215-898-8995. What are you thinking about changing about your dental hygiene this Healthy Aging Month? Share your thoughts with our dentists when you come in for your next appointment!